Recently I've been invited to several food events. I feel kind of guilty coz after all that diet/fast, I end up jumping into a food event immediately after that! 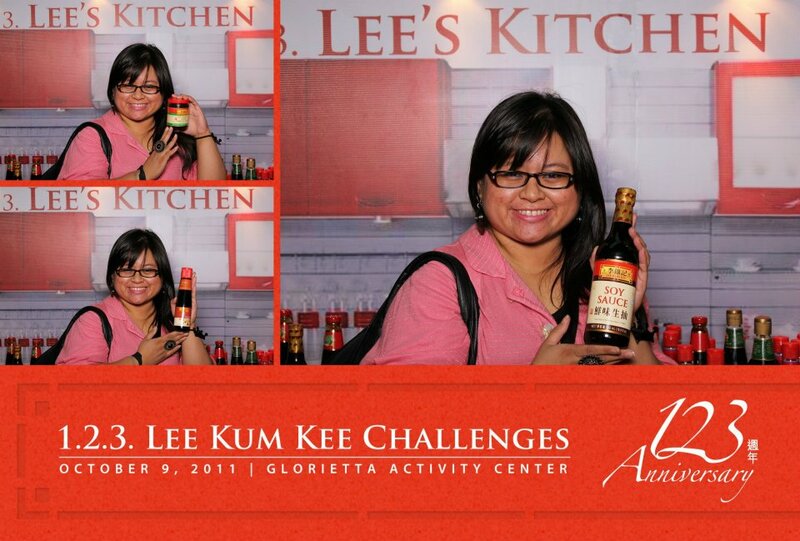 Well I was quite privileged last week coz I was able to attend the last of a Cooking Demo series sponsored by Lee Kum Kee. Do you know that Lee Kum Kee, the leader in Authentic Chinese Sauces is celebrating 123 Years of giving superior quality products to every home? Being here for more than a century proves that Lee Kum Kee stood the test of time by assuring all its consumers that quality, consistency and variety are sealed in each bottle. These three qualities makes a great brand, exactly what Lee Kum Kee is from 1888 up to present, and certainly for the generations to come. In honor of this event, they gave a one-of-a-kind event in this year's loudest, biggest, and grandest cooking demo, the Cook with the Masters Grand Cooking Demo with distinguished chefs in the Philippine Culinary Scene - Chef Sau del Rosario, Chef Sandy Daza, Chef Eugene Raymundo, Chef Him Uy De Baron, and Chef Ernest Gala. Of course last Sunday, as the culminating event, Lee Kum Kee once again sets the bar high as they gave us a one-of-a-kind event in this year’s loudest, biggest and grandest cooking demo, the Cook with the Masters Grand Cooking Demo featuring Lee Kum Kee’s brand ambassador for Southeast Asia and true culinary expert, Chef Bruce Lim. Last October 9, 2011, the mall goers of Glorietta came and witnessed a feast of authentic Chinese aroma and flavors as Chef Bruce Lim shared four mouthwatering dishes that will be a sure fire hit in every kitchen. Lucky audience members, culinary students, media, and celebrities showcased their culinary talents as they stepped in a huge kitchen arena together with Chef Bruce. Lee Kum Kee Products used at the event and on sale as well! Six separate kitchen areas were setup for the instant apprentices, complete with all of the ingredients and Lee Kum Kee products that they needed to prepare each dish. As Chef Bruce shared the step by step process of his recipes to the audience, he also guided the demo participants as they cooked alongside the Master Chef. The cooking extravaganza started off by an exciting and heart thumping performance of Brigada that started on the second floor going down to the activity center. After getting pumped up by Brigada (percussion group band), the guests were welcomed by TV personality and host of the event, Issa Litton. Shortly after, the audiences were delighted by Chef Bruce’s mouthwatering demonstration which started with Three Cup Chicken made with Lee Kum Kee Premium Soy Sauce and Sesame Oil cooked alongside audience members. I could only just watch in amazement as he demonstrated how very VERY easy it was to make this Adobo-like dish using Lee Kum Kee products. The aromas coming from his cooking station was tantalizing. So were the other cooking stations of the selected audience members who were given the honor of being able to cook alongside with Chef Bruce Lim. And for us watching and salivating over the dishes being cooked, we were given a treat! We all got to taste all of the dishes! Also in this round, Chef Bruce demonstrated another recipe, the Oyster Chicken with Mushroom Medley made with Lee Kum Kee Premium Oyster Sauce, Soy Sauce and Fine Shrimp Sauce, a simple yet delicious recipe that you can do with your excess chicken meat. LOVE IT! The chicken meat was super soft! Next dish prepared was the Spicy Seaside Prawns made with Lee Kum Kee Chili Garlic, Premium Oyster Sauce and Seasoned Soy Sauce for Seafood. Culinary students from Center for Culinary Arts and Magsaysay Center for Hospitality and Culinary Arts that battled-off their culinary skills in this recipe. I wasn't able to taste it coz I'm allergic to shrimp or prawns. So here is the SPICY SEASIDE PRAWN RECIPE instead. I heard it tasted absolutely delicious! Last but not the least, the Braised Pork Belly made with Lee Kum Kee Premium Soy Sauce, Oyster Sauce and Hoisin Sauce. Honestly, out of all the food that I tasted that night, this was for me the best!! Super soft and absolutely delicious to eat!!!! This exciting dish was made more exciting as celebrities Baron Geisler, Phoemela Barranda, Desiree del Valle, Enzo Pineda, Rocco Nocino and Steven Silva and Djanine Cruz whipped this dish up for the audiences’ indulgence. Took a photo of Baron Geisler's cooking.. it looks yummy!!! Besides watching the grand cooking demo, attendees also had a lot of fun as they participated in the various activities in the interactive booth area called Lee's Kitchen. It gave the participants a hands-on experience of the products, and a deeper appreciation of the brand's heritage. To make it more interactive, we were given a card were we had to do several steps to be able to have our photo taken at the photo booth and receive a special gift from Lee Kum Kee. So the the area was divided into three main sections. Step 1 - Lee Kum Kee History Wall which showcased the heritage of Lee Kum Kee. At the end of this section, we were asked a random question about Lee Kum Kee History and were given a stamp when our answers were correct! And they also gave cool recipes for dips and sauces! Step 2 - Lee Kum Kee Tasting Area - this is where we were showed the variety of dips and sauces that Lee Kum Kee had and we got to taste it first hand! and a lovely photo souvenir. Photo fun with other bloggers!